It is wonderful to finally be able to unite with other people on this planet, to stand up, to be heard. I am so happy and so proud to be part of Avaaz. Sometimes I can't believe this is really happening! THANK YOU…from the bottom of my heart to all the people who are part of this movement, united in a common spirit. We don't have a lot of time to do it. Our planet is threatened by multiple crises - a climate crisis, food crisis, financial crisis, proliferation crisis... These crises could split us apart like never before, or bring us together like never before. It's the challenge of our time, and the outcome will determine whether our children face a darker world or one thriving in greater human harmony. This is our challenge to meet. With 10 million hopeful citizens and rising, Avaaz is the largest global online community in history. There is no other massive, high-tech, people-powered, multi-issue, genuinely global advocacy organization that can mobilize coordinated democratic pressure in hundreds of countries within 24 hours. Our potential is unique, and so is our responsibility. Making a small but steady weekly contribution enables Avaaz to plan responsibly around long term costs like our tiny but awesome staff team, our website and technology, and the security of our systems (this can get pricey when our campaigns are taking on shady characters!). It also means we have the ability to respond immediately to crises as they occur and jump on opportunities for action without delay. A very small donation of $3 or $5 per week from 10,000 more sustainers would enable our community to expand all our work next year, helping to save lives in humanitarian emergencies, protect the environment and wildlife, support democracy and fight corruption, push for peace and reduce poverty. Fundraising is often a problem for social change organizations. Government or corporate funding would profoundly threaten our mission. Funding from large donors also often comes with strings attached. And high-pressure tactics like telemarketing, postal mail, or direct on-the-street programmes often cost nearly as much as they raise! That's why the Avaaz model - online, people-powered donations - is the best way in the world to power an engine of social change, and a huge part of our community's promise. If we can multiply the number of sustainers we have, it will take our community, and our impact, to a whole new level. I can't wait. I know that donating is an act of hope, and of trust. I feel a huge and serious sense of responsibility to be a steward of that hope, and my team and I are deeply committed to respecting the trust you place in us with your hope, time, and resources. It's a special thing we're building here, and if we can keep believing in each other, anything is possible. With 10 million members in every nation of the world, able to mobilize at a moment's notice to pressing needs and opportunities, Avaaz works –- together we've saved lives in Haiti and Burma, reversed government policies from Brazil to Japan, and won victories on international treaties from banning cluster bombs to preserving oceans. Former UK Prime Minister Gordon Brown says of Avaaz "You have driven forward the idealism of the world... do not underestimate your impact on leaders," while the Economist says Avaaz is "poised to deliver a deafening wake up call to world leaders," and Al Gore says "Avaaz is inspiring, and has already made a difference." We're only 5 years old and growing fast, and the more our members get involved and donate, the more impact we have. With Avaaz, our donations fund high impact campaigns that also recruit more people. More people means more donations, and more impact. So you're not only achieving a particular change with your donation, you're helping grow a community with new members that will multiply your donation many times over, and be a permanent and ever-increasing source of change. It's a tremendous philanthropic value to have this kind of double and permanent impact. 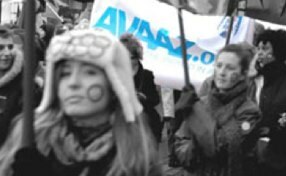 Avaaz is a massive network of citizens, but our organization is absolutely tiny – just 20 full time campaigners with operational and technology support. Most large global NGOs have hundreds or even thousands of staff. Our small size means we have no time for red tape, layers of management, or being focused on anything but getting results. There's a lot of fear out there about misuse of donated money. Most of the fear is misplaced – most organizations are filled with good people trying to do good things. With Avaaz you can be sure – partly because we're required by law to be audited every 12 months. This audit thoroughly checks every aspect of our books and financial practices. We've been audited 4 times since we launched and every time been given a squeaky clean bill of health (for details, click here). Campaigning, advocacy and social change are a serious and demanding business – the more competent the team, the more impact our donations have. Avaaz attracts some of the best campaigners and advocates in the world. Many of our campaign directors joined us after being CEOs of successful multi-million dollar advocacy organizations, and most have degrees from the top universities in the world. Avaaz takes absolutely no money from governments or corporations. This is hugely important to ensuring that our voice is exclusively determined by the values of our members, and not by any large funder or agenda. While we received initial seed grants from partner organizations and charitable organizations, 100% of the Avaaz budget now comes from small online donations. This means that the only agenda we have to follow is the people's agenda. Avaaz has donated more than $5 million to other organizations, because we saw them as better placed than us to have impact on a particular issue. For example, we've granted $1.6 million to Burmese monks and aid groups, $1.3 million to Haitian aid organizations (see this video from the groups that received our donations), and more than $1million to relief organisations in Pakistan. The way we support organizations is important too. Most foundations have endless process and constraints that make them slow, bureaucratic and risk averse in supporting advocacy. Avaaz finds the best people and organizations and doesn't micromanage them – we just empower them to do what they know best. Most charities offer tax deductibility for donations. But this means that they are, in a way, partially tax-payer funded, and governments use that to place a very thick set of rules on what they can and can't do. Chief among them is restricting what they can say to criticize, support, or oppose a politician. Avaaz is very rare in that our donations are not tax deductible, leaving us 100% free to say and do whatever we need to to get leaders to listen to people. Since so many important issues are won and lost in the political realm, this makes us much more effective than advocacy groups that shy away from speaking out politically. Most organizations focus on a single issue over a long period of time. This is very important to do, but that can mean that when desperate needs or amazing opportunities for social change arise, they get ignored because everyone is working on their own issue. Avaaz campaigns target the most urgent needs and opportunities, showing up just when a powerful burst of citizens' attention is needed most. We work continuously with top quality partners in the areas we campaign on, and all describe Avaaz as an amazing added value to their work. The Avaaz model of campaigning is people-powered. Our priorities are set at annual and weekly levels by polls of our membership and every campaign we run is first polled with members. No matter how much work we put into developing a campaign, if it fails to get the greenlight from members, we don't run it. So on a day to day basis, how we spend the donations we receive is determined directly by members. Avaaz is the world's first and only massive, high-tech, people-powered, multi-issue, genuinely global advocacy organization. In a world where the problems we face are consistently global, and the solutions to them increasingly require global democratic action, Avaaz is uniquely placed to effect change. No other organization can rapidly mobilize large-scale, coordinated democratic pressure in over 150 countries within 24 hours. A new model of internet-based, people-powered politics has changed politics in several countries, and Avaaz is taking that proven model global. The result is already the largest global online movement in history, and we're just getting started.